Mark Roberge was not your typical chief revenue officer. For one, he started his career as a computer programmer. With a degree from MIT, he’s been trained to view the professional world through the lense of data, technology and science. So when he came to Hubspot nine years ago as the fourth employee, he applied that lense to build the sales team. The result? Not only did Mark grow the Hubspot customer base from 0 to more than 10,000 customers, but he expanded the sales and service organization from 1 to 425 employees both in the U.S. and internationally. Now, he’s a senior lecturer at the Harvard business school and the author of The Sales Acceleration Formula. 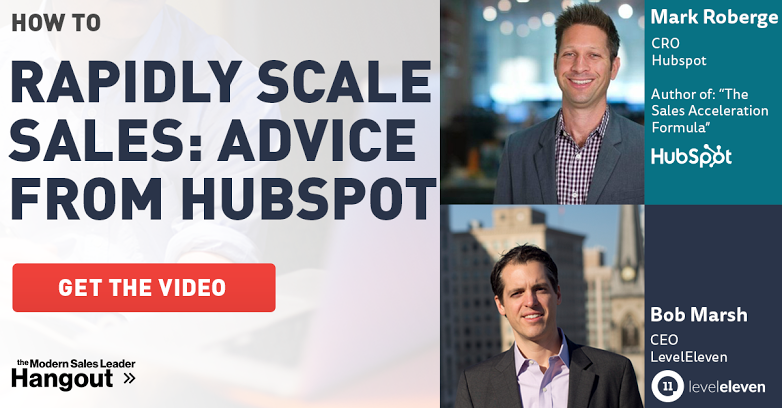 That’s why we asked him for some expert advice on scaling sales. Here’s what he told us. Mark Roberge is not your typical chief revenue officer. That’s why we asked him for some expert advice on scaling sales. Here’s what he told us.